Astrology.Care - What Interior Design Do You Prefer? Earth Zodiac Sign knows! Taurus: Taurus loves everything material, prefers beautiful and comfortable things. The home for this sign is not just a place to live in. It has almost sacred meaning, and is very valuable. Taurus can not live not in comfort, but it is only one of the features to make such people truly satisfied. If you want to please a Taurus - provide a place with comfortable and luxurious design. Ruled by Venus, they are very sensitive and value steadiness and safety. They have great taste naturally and their inner aesthetic feel makes them choose the best option available to decorate the house. They are quite lazy and like to pamper themselves and their loved ones, so they will try to make their home a maximum comfy place for a good rest or just a quiet day there. Their taste can be described as classic, elegant and all times beautiful. The beauty they are appealed to is timeless and natural. If they are in a good financial situation they will put do much money into the garnishment of their houses. They will add a touch of luxury that they really need. They love flowers and plants, so maybe their house will be accompanied by a garden or greenhouse. At least small pot-garden will be created for sure. When you have been in the house of Taurus at least once, you would never forget this style. 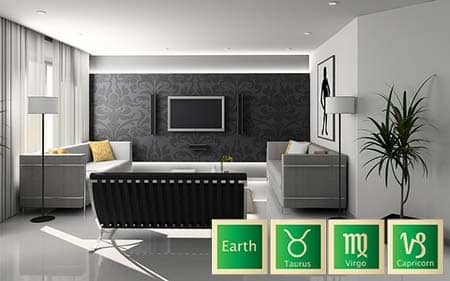 Practical, beautiful, everything of high quality, soft lighting, lots of pillows and blankets - these are the features of every house of Taurus. Special attention will be paid to kitchen, as Taurus is a gourmet. Virgo: Virgos are very thorough and detail-oriented people when it comes to any activity that they must complete. They are keen on details, and they are the real professionals of small things. When you are at Virgos' home, you can't say that it is something extraordinary, but you will remember this style for a long time, because due to the details their home looks harmonious and pleasant to look at. Virgos can choose interior design or architecture as their professional field, because they have amazing feel of space and vivid imagination. We can say for sure that Virgos have special design for almost every item in the house. They know how it should look and why. They hate mess, so their homes are clean and tidy. As every thing in their house has its own place, they have no odd stuff, even more - clutter makes them irritable and uneasy. That's why Virgos often use as many tools, as possible to get rid of a clutter: wall-mount wardrobes, pragmatic space usage, drawers and closets. They need to keep it organized. Virgo is a creative sign, but they will never make home a stuffed with things place. Interior tendencies of this sign are wooden furniture, pastel or light colors, smooth and soft surface, lots of space-saving tricks like built-in drawer in the bed. Capricorn: All the elements of Earth are very demanding in their tastes and choices. Capricorn has the #1 place among them. 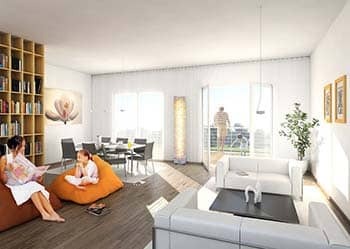 When they design their apartment, it is useless to give them any kind of advice, because they know for sure how it should NOT be, and can search for the right option themselves. They usually pay more attention to the components and form, well-made details and quality of the thing. Color palette is not so important for Capricorn, but it should be well-composed and neutral. The main emphasis is held by the quality of the material and its durability. Their colors of preference are mostly Earth-like: green, brown, dark grey, sky blue, gold. They say no to sophisticated and strange designs. They don't get this ornament thing, they need their furniture to be sturdy and comfortable. If it is a bit old, but reliable property - they will definitely prefer it over modern, but less durable one. Capricorn may not be very enthusiastic when decorating their home, but the process of making home comfortable and practical leads to an excitement in their eyes. However, they really like windows and can decorate it willingly with beautiful curtains and different tricks to make windows look bigger. Their house will definitely have wooden, stone, clay or sculpted elements. Also it is important to have a lot of options for storing, as they may create chaos due to their active lifestyle.